Absolutely - The web site - Merchandise that was available and little known facts. Absolutely - Did you know? that you may not have known about Absolutely and stuff from YOU the viewer. Note : NONE of these items listed here are available any more, all have all been withdrawn. If you have them look after them ! This 240 page book was published in 1992 by Boxtree ltd and cost £6.99. even gives has the words to the songs listed. The foreword is by Jesus Christ. Click on the thumbnail to view the cover. Here is an example of two pages from the book. Pages 54 and 55 - Little Girls' Baby Jesus sketch. Click on the thumbnail to read it. Official Video releases - These were the only releases of the shows. This 75 min video was published on 21st Sep 1992 on PolyGram Video by Channel Four Television. A collection of the zaniest sketches from channel 4's acclaimed TV comedy show, Absolutely. Featuring such characters as the Stoneybridge Councilors, the Nice Family, Little Girl, Frank Hovis, Don and George and many more of their off-the-wall creations. Click Here for a sketch guide for this video. I managed to buy this just a few months before it was deleted. This second 75 min video was published on 11th Apr 1994 on PolyGram Video by Channel Four Television. It was another collection of sketches, not as good as "the vido". I do not have this video as it was deleted before I had chance to buy it ! Jack Docherty and Moray Hunter went on to have their own comedy series together in 1993 called "Mr Don and Mr George". Basically this was six episodes featuring the two characters Don and George. I have all 6 episodes of Mr Don and Mr George on tape which I recorded at the time. But they were released on video as you can see here. I would like to thank Phil Quinton for providing the cover scans. Click on the thumbnails to view the covers. This video came out in 1991, released by Mirage Television Productions. 'An evening of Comedy and Music in aid of the sick kids appeal' This event took place on Sunday 1st December 1991 at 8pm in Edinburgh. It features numerous comedy and music acts who performed live to raise money for the the T.A.S.K. appeal. Amongst the performers were the Absolutely team !, Sketches including Stoneybridge council, Calum Gilhooley, McGlashan, Frank Hovis and Little Girl. Other well know performers included Norman Lovett, Steve Coogan, Arnold Brown, Muriel Gray, Jonathan Ross, Wet wet wet, Jools Holland. Was this the only LIVE performance by the Absolutely team? Are YOU the person that bid £160 for the autographed poster at the end of the gig, get in touch if you are. I would like to thank John Innes for lending me this video. This has to be the most rarest of finds!, A T-shirt with the Stoneybridge Olympic bid printed on it. It was bought in a small "rocker" shop in Antwerp, Belgium in summer 2005, ironically 7 years after I starting working there. I lived in the city for 4 years, left, spent 1 year elsewhere, and two years later I found it in a shop which had always been there, where I'd bought my leather jacket. Has anyone else out there got a T-shirt ? I would like to thank Smid from Wolverhampton for photographing his T-shirt. This is an original audience ticket for the filming of an episode of Absolutely series 4 at LWT. This particular ticket has little green label which was only on a few tickets, it gave audience members entry to the green room and bar after the show with the cast!!! I would like to thank Jacqueline Fleming for scanning this ticket. These are tickets for the 2005 Edinburgh Fringe Festival where John Sparkes and Pete Baikie performed. I would like to thank Jacqueline Fleming for scanning these tickets. 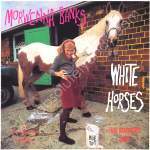 Morwenna Banks single of white Horses (cover of Jackie Lee song). This comedy single was recorded in 1995 and Morwenna is backed by The Adventures Of Parsley recorded at Toe Rag Studio in the Medway - home of Billy Childish and the White Stripes among others. Click on the thumbnails on the left to see the front and back of this single. I would like to thank Steve Panter for providing this information. Visit Steves Jackie Lee website by clicking HERE. I would like to thank Mark Boyle of Johnstone for providing the following information about Mcglashan. Please do not read if easily offended, these are the views of Mark Boyle and are not meant to be taken seriously. McGlashan : I've a feeling he was inspired by some members of Siol nan Gaidheal, several of whom were active in Edinburgh during the 1980s, had a tendency towards semi-national costume (especially Balmoral berets with feathers in them!) and whom believed all manner of anti-English conspiracy theories. The giveaway was the hysterical weather sketch when McGlaschan invades the TV weather forecast & takes all the rain cloud stickers off Scotland & puts them all down in England, & moves all the sunshine ones up north! One of SnG's pet theories was that British weather forecasts always made Scotland seem wetter than it was to put people off going there on holiday, rather than it simply being they kept getting it wrong (so no change there!). called the Little Tartan Dolls In A Plastic Tube as well somewhere, but all roads lead right back to Siol & its leader Jackie Stokes (now dead), no matter what the alias of the time. They had a magazine at the time called "Siol", which you could get from your local "radical book & magazine shop" (eg, Clyde Books in Parnie Street Glasgow) back in the days before local councils rocketed up the rents to kill them all off. It would have things for readers to copy & post up in their area such as a page saying "Welcome to Scotland" in the main five European languages plus Gaelic, but the bit in the English language simply said "ENGLISH GO HOME!" Would have been funny if they weren't serious - "Absolutely" however succeeded in doing just that! evils!) & demanding that everyone learns to speak Manx to save it from extinction, whilst moaning that no one teaches "real" Manx anymore anyway...incidentally most of MV can't speak a word of Manx! Welsh, Scots and Irish, yes, but when's it going to be the Manx?